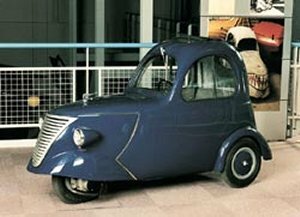 Built in the Netherlands in 1949 the royal range car: DAF-kini was designed by Hub van Doorne as a small car for the masses. Nicknamed “ (rijdende) regenjas" which is literally "(driving) overcoat" the vehicle was never put into mass production. The only prototype that existed was purchased by a circus though today the car is now at the DAF museum in Eindhoven. (Netherlands).